Garrett formerly served for six years as an officer in the U.S. Military, was elected to the position of attorney for Louisa County, and completed two terms as a state senator for the 22nd District. Rep. Garrett joined the House Freedom Caucus and has cosponsored legislation introduced by other House Freedom Caucus members. Rep. Garrett has taken a principled stance on a full repeal and replacement of Obamacare. He committed to vote no on the American Health Care Act, H.R. 1628, which has been criticized for falling far short of Republicans' promises to repeal ObamaCare. Thanks to Rep. Garrett and other members of the House Freedom Caucus, House Republicans will have another shot to address the cost drivers of health insurance premiums in Title I of ObamaCare. The American Conservative Union presented the Defender of Liberty Award to Garrett for his conservative voting record as a state senator in 2013 and 2015. He has also been recognized by the Virginia Association of Commonwealth's Attorneys and the Virginia Chamber of Commerce for his commitment to justice and promoting conservative legislation. 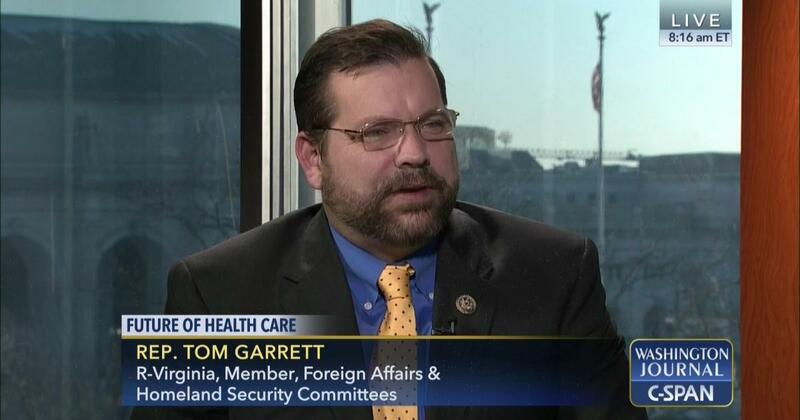 During Rep. Garrett’s first 100 days in Congress, he co-sponsored the Competitive Health Insurance Reform Act (H.R. 372), ObamaCare Replacement Act (H.R. 1072), Stopping EPA Overreach Act (H.R. 637), and Death Tax Repeal Act (H.R. 198). These bills align with FreedomWorks’ values of limiting government, lowering taxes, and give more freedom to his constituents and the American people. Because of his commitment to preserving economic freedom and individual liberty, FreedomWorks is proud to name Rep. Tom Garrett as the Member of the Month for May 2017. We look forward to working with him and other House conservatives to uphold the Constitution and limit the size and scope of the federal government.